Private schools are an amazing opportunity for students to receive a quality education, and work towards a successful future. They have a reputation for being the best in many areas, including instruction, clubs and organizations, grades, and of course, school sanitation. When people think of private schools, they think of a clean, well-maintained property where happy students learn. Private school sanitation cleaning solutions are an important consideration. The more dirt and bacteria you trap before it can enter the building, the better your control is over what does make it in. 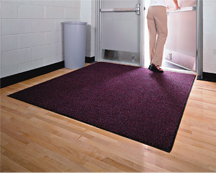 A good and affordable means of picking up bacteria and dirt before it enters the building is the use of mats, like walk off mats and scraper mats. Modern designs are attractive and blend in, and newer mat capabilities allow for superior school sanitation. For the dirt and bacteria that does make it by, a combination of clean wet mops and dust mops can handle that with ease. Making sure these mops are clean is important, however, or else dirt and bacteria is just pushed around rather than eliminated. Using mops with special cleaning solution applications, such as microfiber, use newer technology to clean better, faster. Being thorough with school sanitation will ensure less faculty and pupils become ill, and it upholds the clean, presentable reputation of the school. Few people are well-informed on the best cleaning solutions for control and elimination of dirt and bacteria, but staying up-to-date with products and knowledge can help in many ways. For over forty years, Lord Baltimore has provided reliable, cost-effective private school sanitation cleaning solutions throughout Maryland, Washington DC, Northern Virginia, Southern Pennsylvania, and Delaware. To learn more about how school sanitation and cleaning solutions are top priorities for high-traffic places such as private schools, please contact Joe Bateman at Lord Baltimore by calling 800-292-1224. This entry was posted on Thursday, November 12th, 2015	at 5:57 pm	. You can follow any responses to this entry through the RSS 2.0	feed. Both comments and pings are currently closed.